Context: Mycotic infections are gaining importance in the present day medicine, and definite demonstration of fungus is essential for diagnosis. Small numbers of organisms in the smear can be identified by fluorescence microscopy. Calcofluor white (CFW) fluorescent stain is a textile brightener mixed with Evans blue. It is expensive and not easily available. Aims: (1) To assess the efficacy of in-house CFW fluorescent stain for fungus in relation to conventional CFW stain, histopathology, and culture. (2) To determine sensitivity, specificity, negative predictive value (NPV), and positive predictive value (PPV) with culture as gold standard. 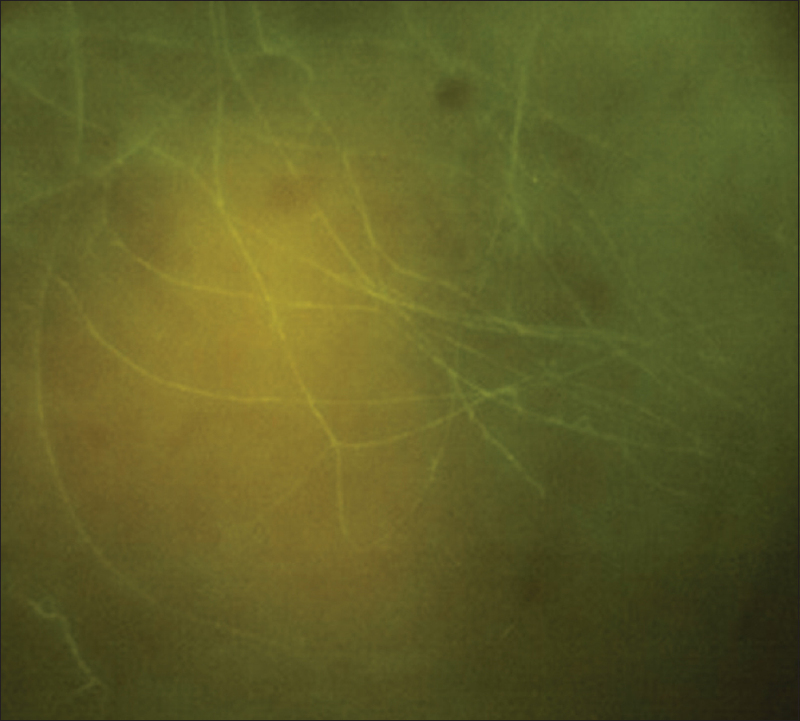 Settings and Design: One hundred cases of suspected dermatophytosis and 15 cases of systemic mycosis were included in the study. Subjects and Methods: The local whitener Ranipal is added with Robin blue, another brightener, and was used to stain teased fungal cultures. Skin, hair, and nails require pretreatment with potassium hydroxide (KOH). Biopsy slides require deparaffinization and pretreatment with KOH before staining. Conventional calcofluor stain, histopathology, and culture were done. Statistical Analysis Used: Statistical analysis was performed using sensitivity, specificity, NPV, and PPV. Results: The results are consistently comparable with conventional stain. The sensitivity was 100%, specificity was 93.3%, NPV was 100%, and PPV was 85.7%. It is also cost effective when compared to commercial stains. Conclusions: In-house stain can be used for screening of fungus in direct samples, biopsies as alternative in resource-constrained laboratories. Mycotic infections are gaining importance in the present day medicine due to the increasing incidence of immunocompromised patients. Definite demonstration of fungus is important as antifungal treatment is expensive, long-term, and associated with side effects. Sometimes, it is difficult to identify the causative agents when they are present in small numbers in the sample by conventional diagnostic methods such as potassium hydroxide (KOH) mount, lactophenol cotton blue, and India ink preparation for cerebrospinal fluid. Calcofluor white (CFW) fluorescent stain is routinely used for demonstration of fungus. The use of CFW in clinical mycology was first described by Harrington and Hageage. It is a textile brightener mixed with Evans blue More Details. It binds to beta 1–3 and beta 1–4 polysaccharides, such as found in cellulose and chitin, and when excited with ultraviolet or violet radiation will fluoresce., CFW selectively binds to the cellulose and chitin of the fungal cell wall and when visualized under fluorescent microscope gives apple-green fluorescence. To determine sensitivity, specificity, negative predictive value (NPV), and positive predictive value (PPV) with culture as gold standard. One hundred cases of clinically suspected dermatophytosis cases were studied by conventional stain, in-house stain, and culture. 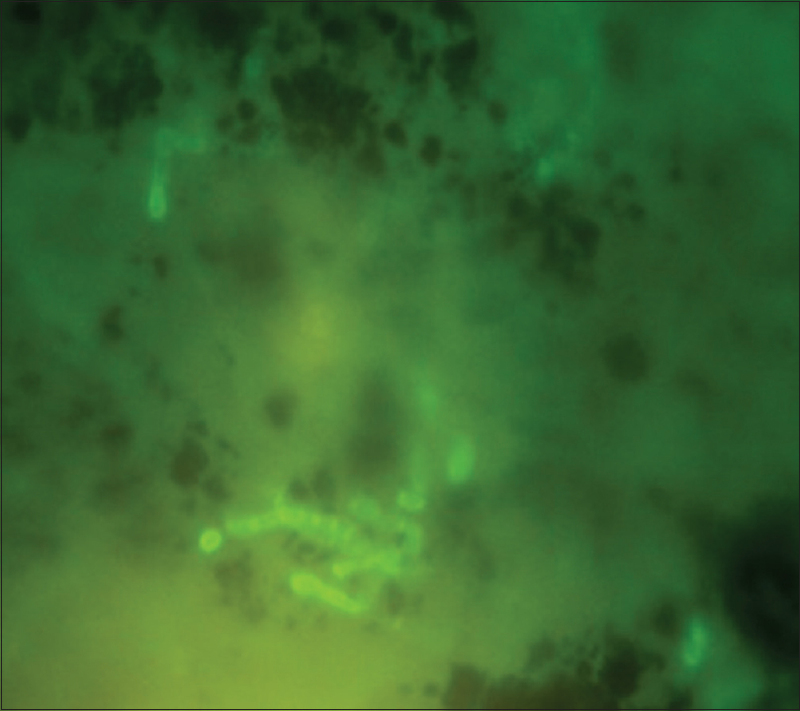 Fifteen deparaffinized tissue section smears from clinically diagnosed fungal infections were submitted to fluorescent staining with the in-house stain and compared with histopathology. CFW is expensive and not easily available. There are studies abroad with different other local brighteners. Hence, I have tried the local whitener Ranipal to stain teased fungal cultures. It was good, but there was nonspecific fluorescence. Hence, I added another brightener Robin blue. Robin blue stain can be used as a counterstain – either after the CFW staining or incorporated in the CFW solution. One drop of working solution is placed on a clean glass slide. Small amount of specimen is taken and emulsified. Coverslip is placed to obtain as thin a film as possible. It is viewed under fluorescent microscope after 5 min using exciter filter (355–425 λ) and barrier filter (460 λ). Skin, hair, and nails require pretreatment with KOH., Biopsy samples require deparaffinization and pretreatment with KOH before staining. Slides are immersed overnight in 10% KOH solution. Working solution is added to slide and is allowed to act for 10 min. Excess stain is drained and slide is washed. A drop of fresh working solution is added. A pinch of both whitener and brightener can also be mixed in little distilled water for ready use. Staining with commercial readymade stain (Sigma-18909) was also performed on another slide [Figure 1]. 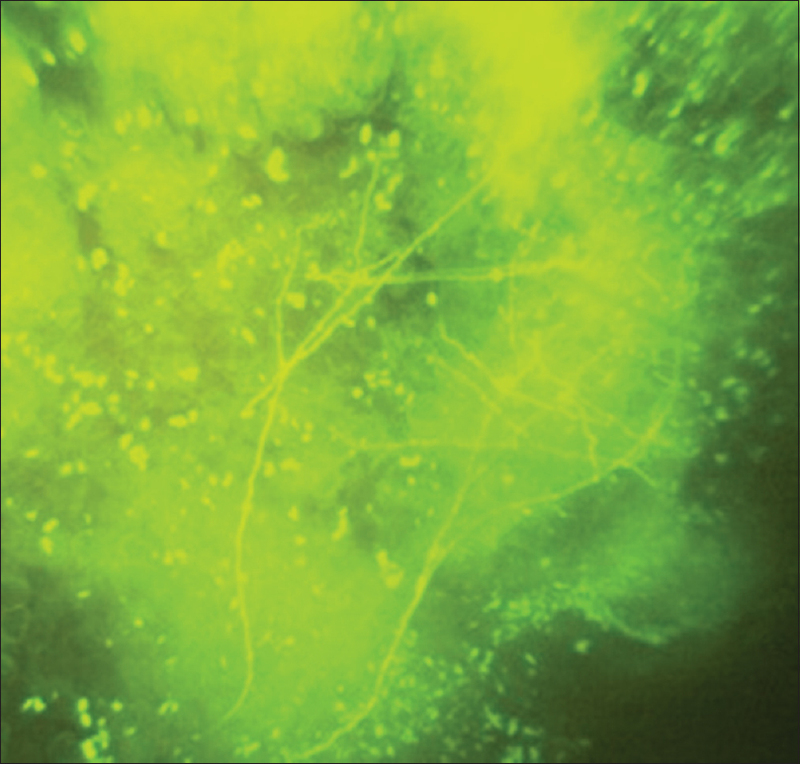 This stain gives apple-green/blue-green fluorescence to the fungi [Figure 2] and [Figure 3]. Stain also produces a contrasting dark background, thereby enhancing the detection of fungi. This stain has given wonderful results with fungal cultures, fungal elements in samples. When compared with conventional stain out of 100 samples both showed 35 positives and 65 negatives [Table 1]. The value of R is 1. This is a strong positive correlation, which means that high X variable scores go with high Y variable scores and vice versa. 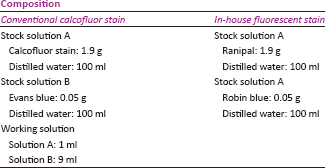 Out of 15 deparaffinized tissue sections stained with the in-house stain, 12 showed fungi, whereas histopathology was positive for 10 sections [Table 2]. Out of 12 positive smears for fungus, 5 were Aspergillus, 3 were Mucor, 2 were Candida, and 1 each were Rhinosporidium seeberi and Pneumocystis carinii. Out of 12 positive tissue sections by fluorescent microscopy, only 10 were positive by standard histopathological staining technique. One doubtful and one negative tissue sections by standard histopathological staining technique were shown to be positive for fungus by the in-house fluorescent stain [Table 3]. Comparison of in-house stain and histopathology showed a R = 0.8871. This is a strong positive correlation, which means that high X variable scores go with high Y variable scores and vice versa. When compared with culture, 30 were positive by culture and 35 were positive by in-house stain [Table 4]. Five samples were negative in culture even if positive by microscopy. For a positive direct microscopy and a negative culture, there are two broad explanations; first, it may be a false-positive microscopy due to artifacts and a true-negative culture. Alternatively, the direct microscopy may be truly positive, and the negative culture is a false negative due to nonviability of fungal elements in some cases, nonreported partial treatment with antifungal agents, and inadequacy in sampling due to very small lesions. Here, these are taken as false positives. Sensitivity was 100%, specificity was 93.3%, NPV was 100%, and PPV was 85.7%. Time required for staining as well as screening for fungus is less when compared to histopathological staining., This is more economical than histopathological staining when fluorescent microscope is available. Components used in conventional CFW stain are not readily available, very expensive, and carcinogenic. Therefore, extreme care must be taken, whereas in-house stain is readily available, very cheap, and not harmful to handle. A trained technician can identify the presence of fungus. Expert is required for identification of fungus. It helps in rapid diagnosis, more so if it is in situ identification. It is most useful for fungi in specimens and cultures, in CSF, and in blood cultures. Conventional CFW stain costs Rs. 80/10 ml when individual components are purchased, and mixed and readymade stain (Sigma) costs Rs. 170/10 ml. However, our in-house stain costs Rs. 0.15/10 ml [Table 5]. Stains should be fresh and sample should be fresh. The reduction of emission intensity is called “fading.” It could be because of either “photobleaching” or “quenching.” Hence, the sample should be seen immediately. To prepare and throw away, the stain everyday becomes even more expensive with conventional stain and very negligible with in-house stain. This in-house stain can be applied to any sample where the demonstration of fungus is desired. In a developing country like India, the prohibitively high cost of conventional fluorescent stains such as CFW prevents the use of fluorescent microscopy in most institutes, despite the availability of fluorescent microscopes and expert personnel. The present in-house stain overcomes this hurdle and definitely very useful, given its low cost and higher sensitivity when compared to routine stains. This stain has given wonderful results with fungal cultures, fungal elements in samples with small workup like that skin, hair, and nails require pretreatment with KOH. Biopsy samples require deparaffinization and pretreatment with KOH before staining. Harrington BJ, Hageage GJ Jr. Calcofluor white: A review of its uses and applications in clinical mycology and parasitology. Lab Med 2003;5:361-7. Koneman EW, Allen SD, Janada WM, Schreckenberger PC, Winn WC. Colour Atlas and Textbook of Diagnostic Microbiology. 5th ed. Philadelphia: Lippincott-Raven Publishers; 1997. Collee JG, Fraser AG, Marmion BP, Simmons A. Mackie and McCartney Practical Medical Microbiology. 14th ed. Edinburgh: Churchill Livingstone; 1996. Kurade SM, Amladi SA, Miskeen AK. Skin scraping and a potassium hydroxide mount. Indian J Dermatol Venereol Leprol 2006;72:238-41. Hamer EC, Moore CB, Denning DW. Comparison of two fluorescent whiteners, calcofluor and blankophor, for the detection of fungal elements in clinical specimens in the diagnostic laboratory. Clin Microbiol Infect 2006;12:178-96. Monheit JE, Cowan DF, Moore DG. Rapid detection of fungi in tissues using calcofluor white and fluorescence microscopy. Arch Pathol Lab Med 1984;108:616-8. Khan SA, Xess I, Rai A. CFW (calcofluor white stain): A rapid detection system for nosocomial fungal infection. Indian J Appl Res 2015;5:692-4. Simmons DM, Mercer AV, Hallas G, Dyson JE. Characterization of six textile dyes as fluorescent stains for flow cytometry. J Histochem Cytochem 1990;38:41-9.